From the anime and manga “Gundam Thunderbolt,” the Psycho Zaku has been designed with heightened proportion and features by mechanical designer Hajime Katoki. Unique aspects to this release include giant special booster seen only in the animation, completely articulated sub-arms that can fold into backpack, realistic joint and power pipe covers, and sole mounted-claws. 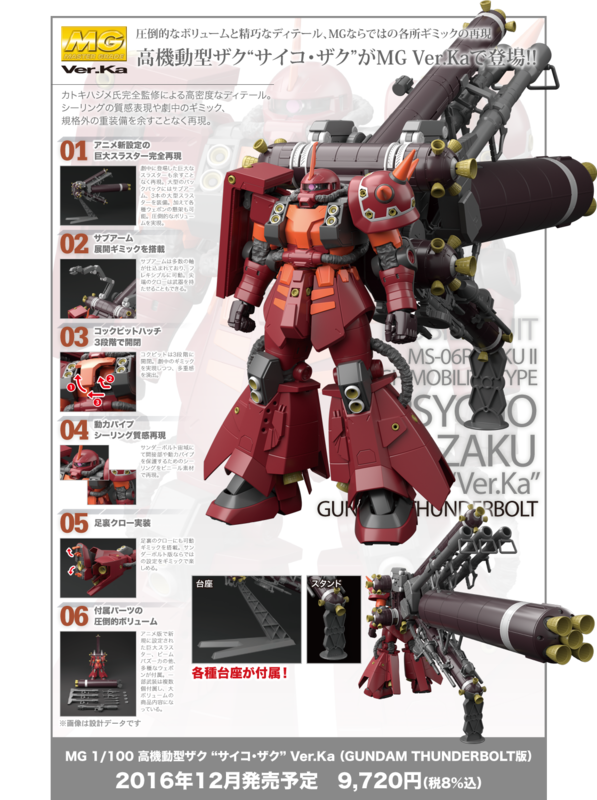 Weapons include beam bazooka, 3 giant bazookas, 2 zaku machine haws, 2 heat hawks, 3 storm fausts, display 2 types of dispay stands. Runner x 35, water slides, 10 vinyl covers, springs for leg pipes.